OI! YES, I'M BARKIN' AT YOU, YOU NINNY! Re: Who has a fursuit? 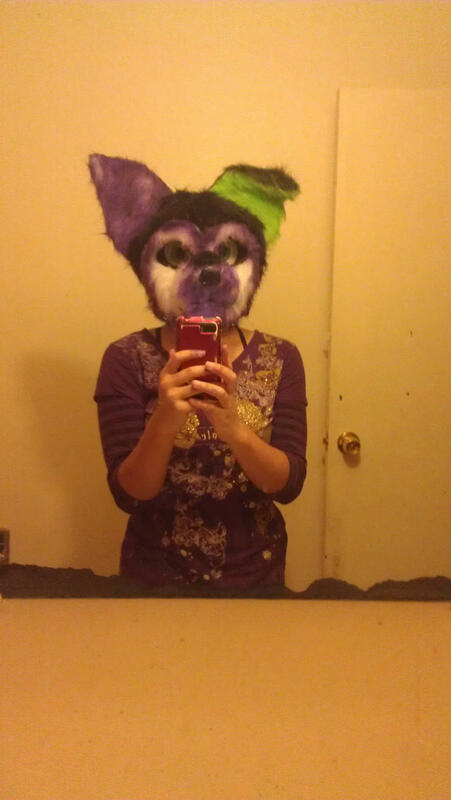 There is a picture of the fursuit head on my Fur Affinity, maybe even Deviant Art. Bastsheba, I'll check it out! Well for one, I do not own one- So I do not wear one. And, I don't think I'd ever get one. They're cool and all, but I think they are just strange. Too hot, bulky, no visibility. I'm just not really a fan of them. Like, I see pictures of people wearing them in public and my reaction is, "That's weird." Kind of strange that I think that. I made a couple heads, paws, and alot of tails. I love wearing tails. I love fursuits they look like so much fun to wear, except in the summer though. For my first suit im getting Cassandra done hopefully by MixedCandy. I love their suits and I think they'll capture Cassandra's personality perfectly. Full suit or partial suit, it really depends on what their offering at the time, i prefer a partial but i dont mind getting a full suit either it'll just cost more. I dont think I'd every really get a suit. I'd like to try it one day though to see what it's like. If a friend ever got one though I would be their handler? Is that what there called? They guy who stops them walking into lamp posts and watches out for them. I've got Phoenix Wolf Suits in mind. I like their style, and there prices should be affordable for me. I just got back from a local con and its put my mind to the idea of starting on a suit. Sadly I don't think I'll be able to until I move out because I'll have no where to put it since my room is full of all my junk and old cosplays. Going to Furnal Equinox on Saturday. I'll be sure to get some photos done. That the circus themed one this year? Cool! If you see me I'll be fursuiting in my brown dhole fursuit. I'll probably be hanging around a purple snow leopard haha. If you want, pm me your cell if you wanna meet up. I have horrible memory and I'll only be there from 12 - 6. Can't wait 'till I can get one... Wonder how hard to make/find an afordable partial... Thinking of going as a furry Edgeworth to Nebcon in October.